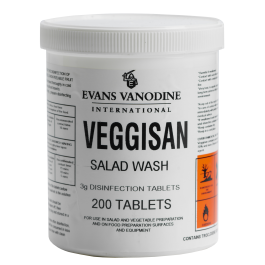 Evans Veggisan are fast dissolving effervescent tablets which produce a solution containing 100ppm available chlorine when added to 10ltres of water. The solution allows for vegetables and fruit to be washed without the water being a source of contamination. The product is highly recommended for may applications in food preparation areas, such as wiping down work surfaces and ceramic floor and wall tiles as well as soaking mops and cloths. Quick dissolving, easy to use tablets. Effective against al types of food spoilage organisms. Long shelf life, stable for up to 5 years. Safer to handle and transport than liquid hypochlorite. Has a pH of 5.5 when diluted. Full case pack size - 6 x 200 Tablets. Catering: 1 tablet per 20 litres of water provides 50ppm. Wall, Tiles and Floors: 1 tablet per 5 ltre of water provides 200ppm. Cutlery, Crockery and Glassware: 1 tablet per 8 litres of water provides 120ppm. Cloths and Mops: 1 tablet per 20 litres of water provides 50ppm. Vending and Soft Ice Cream Machines: 1 tablet in 5 litres of water provides 200ppm. Non Porous Work Surfaces: 1 tablet in 5 litres of water provides 200ppm. Decontamination of Fruit and Vegetables: Prepare a solution at a concentration of 50ppm available chlorine by dissolving 1 tablet for every 20 litres of water. Immerse the fruit or veg in the solution for 5 minutes, agitating to maximise decontamination. Remove the foodstuff from the solution and drain thoroughly. 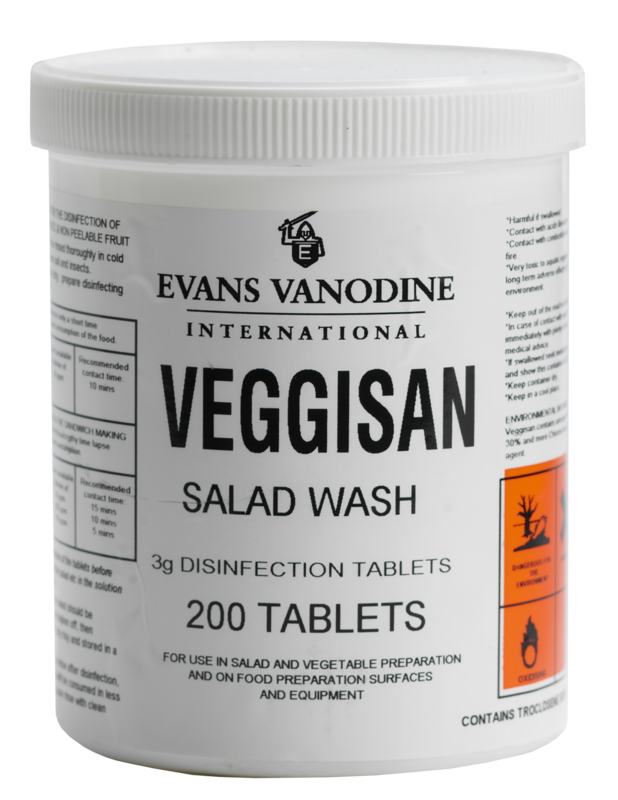 Replace the vegetable washing solution frequently.